Good residue management in the fall will help enhance drill performance, allowing for increased seed survival and an overall better field uniformity in the spring. Changing the angle of vanes on the back of the chopper will help with the width and uniformity of residue spread. While swathing or straight combining, keep an eye out for weed escapes. Unless they are an obvious sprayer miss or are weeds not well controlled under the herbicides used on the field, they could be herbicide resistant weed patches. Some growers are reporting high numbers of adult flea beetles. 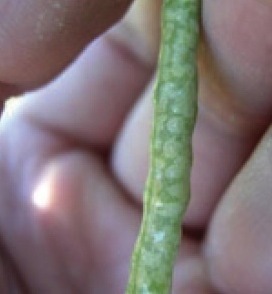 Adults emerge from pupae in late July and August and overwinter to feed on young canola seedlings the following spring. These same adults do feed now, but Julie Soroka and Larry Grenkow (Can. J. Plant Sci. 2012: 97-107) found that flea beetle feeding on canola in late-summer is rarely an economic concern. Usually the best response to a light frost is to leave the crop standing to mature fully and continue to clear green. On behalf of Curtis Rempel, Canola Council of Canada vice president crop production and innovation, please join us for the 2015 Canola Discovery Forum October 27-29 in Canmore Alberta. The optimal swath timing for canola yield and quality is when 60% of seeds on the main stem are showing some colour change. Seed colour change (SCC) is considered any amount of yellow or brown on the seed. This increases crop yield because side branches have longer to fill and average seed size for the whole plant is larger. Pre-harvest is a good time to scout for disease severity. 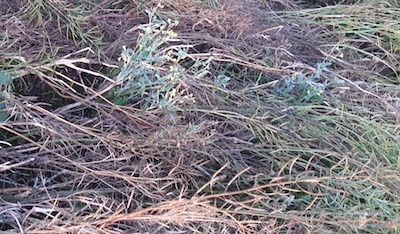 The photo above shows severe sclerotinia infection. This article includes sclerotinia and various other diseases to look for.